+In the Name of God, the Living One, Word, and Spirit. Amen. What binds us is slain, what surrounds us is destroyed, all desire is gone, ignorance is dead. We are free to remember eternity. We shall rest in Silence for all ages and aeons. Amen. On the first bead after the cross say the "Our Father”. Hail Mary, full of grace; the Lord is with thee. Blessed art thou amongst women, and blessed is the fruit of thy womb, Jesus. Holy Mary, Mother of God, pray for us now, and at the hour of death. Amen. Name the mystery and read the thoughts and prayer that follow each one. Begin with the “DO NOT WEEP...: on the bead just before the medal and “THE SAVIOR HAS MADE ME WORTHY...”on the next ten beads following the medal. On the chain following these ten beads, say the GLORIA PATRI...with the BLESSED are you...Then, name the next mystery and proceed as above until all the mysteries have been said—End with the closing prayer and novena. Do not weep and do not grieve, The Savior’s grace is with you. Let us praise the One who made us truly human. Amen. The Savior has made me worthy, and knows me very well. Jesus loves me beyond all measure. I drink from the stream of Living Water. I have seen the Lord. Amen. Glory to you, O God, Living One, Word, and Spirit, now and for all ages and aeons. Amen. Blessed are you that did not waver at the sight of me, for where your mind is, there is your treasure. Amen. 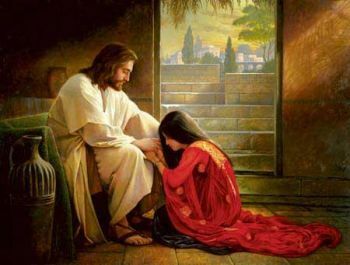 Prayer: O God, through the intercession of St. Mary Magdalene, may we receive the grace to relinquish our illnesses and infirmities, begin our journey out of darkness towards the dawn, and open ourselves to the light of God, that we may be enlightened and raised to new life and consciousness. Amen. Prayer: O God, through the intercession of St. Mary Magdalene, help us follow the inner path of abandonment and non-attachment, that we may ascend with Jesus to a new awareness of love and so better serve others in the vineyard of the Lord. Amen. Prayer: O God, through the intercession of St. Mary Magdalene, who learned the inner knowledge at the feet of the Savior, grant that we may so fully enter the depths of our own hearts that we may discover therein the burning flame of Divine Love. Amen. When Mary came to where Jesus was and saw him, she fell at his feet and said to him, “Lord, if you had been here, my brother would not have died.” When Jesus saw her weeping, he became perturbed and deeply troubled, and said, “Where have you laid him?” They said to him, “Sir, come and see.” And Jesus wept. 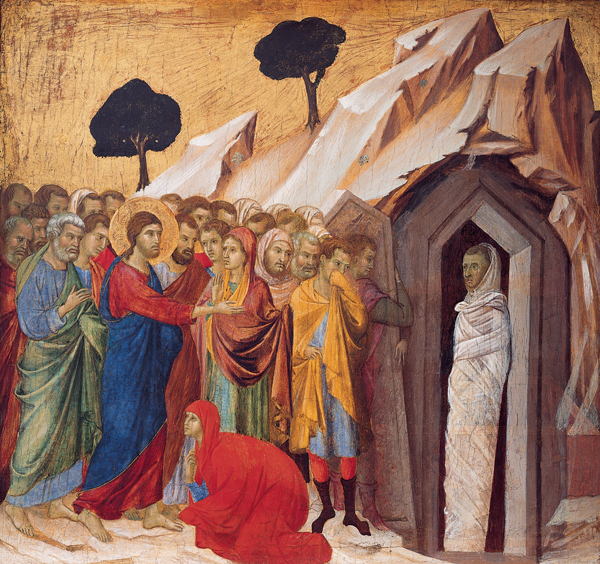 Jesus cried out in a loud voice, “Lazarus, come out!” And the dead man came out. So Jesus said, “Untie him and let him go.” Jn 11:32-35; 43-44.
gardens of life, mindful of the deep love of the Savior. Amen. Prayer: O God, through the intercession of St. Mary Magdalene, whose heart was cleansed and opened by Jesus, help us open the doors of our hearts to rise up and meet the Savior who illuminates our souls . Amen. 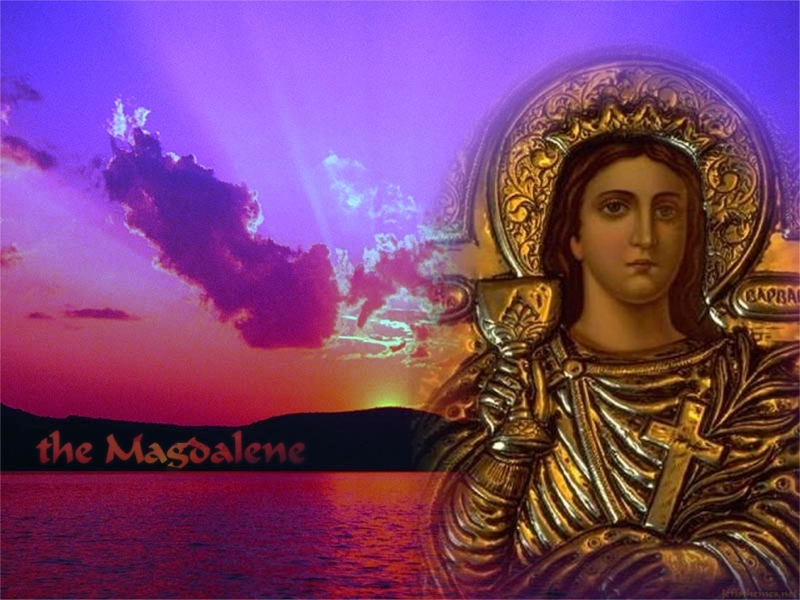 Prayer: O God, through the intercession of St. Mary Magdalene, may we receive the grace and presence of Holy Wisdom, to raise us up from error into your heavenly realm of knowledge and light. Amen. 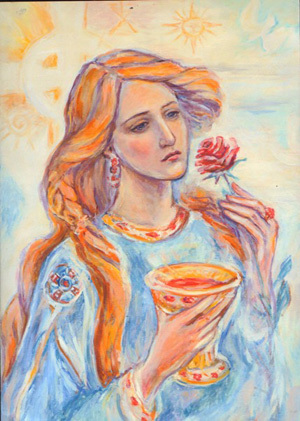 Prayer: O God, through the intercession of St. Mary Magdalene, may we be anointed with the gift of spiritual love which is wine and fragrance, and may the name of the Savior spoken with love be a spreading perfume which draws us to the royal banquet, for the nourishment, healing, and liberation of all humanity. Amen.